In small bowl, combine 1 tablespoon of the beaten egg and 2 teaspoons water; cover and refrigerate. Use bread machine that produces 1 1/2-lb. or larger loaf. Lightly spoon flour into measuring cup; level off. Measure remaining ingredients carefully. 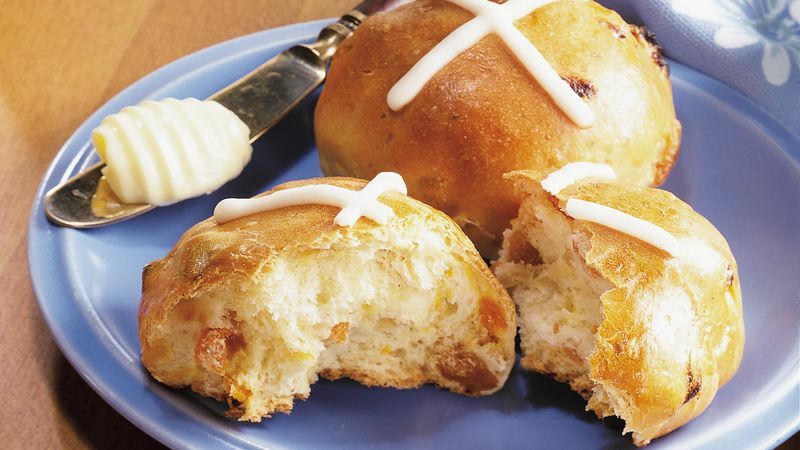 Follow manufacturer's directions for placing all dough ingredients except reserved egg mixture and apricots in bread machine pan. Select Dough cycle. Do not use delay cycle. Follow manufacturer's directions for starting machine. Spray large cookie sheet and work surface with nonstick cooking spray. Remove dough from machine; place on sprayed surface. Flatten dough slightly; sprinkle with apricots. Knead lightly to distribute apricots. Divide dough into 16 pieces. With sprayed hands, roll each piece to form ball. Place 2 inches apart on sprayed cookie sheet. Cover; let rise in warm place (80 to 85°F.) until light and doubled in size, 45 to 60 minutes. Heat oven to 350°F. Uncover dough. Mix reserved 1 tablespoon beaten egg with 2 teaspoons water; brush rolls lightly with egg mixture. Bake at 350°F. for 16 to 18 minutes or until light golden brown. Immediately remove from cookie sheet; cool on wire rack for 20 minutes. In small bowl, combine powdered sugar and enough juice for soft frosting consistency; stir until smooth. Place frosting in small resealable food storage plastic bag. Cut small opening in bottom corner of bag. Squeeze frosting onto rolls in cross pattern. Use yeast labeled "bread machine" or "quick" or "rapid" for best results. Dry yeast for bread machines comes in a 4-oz. jar. It is a finer granulation than regular dry east and therefore doesn't need to be dissolved in water before mixing with other ingredients. It also contains ascorbic acid which lends better structure and more volume to the bread. To easily cut dried apricots, spray your knife or kitchen scissors with nonstick cooking spray. If your bread machine has a special signal for adding dried fruit, the apricots can be added at that time.